For more info about the program please contact us. These resources will help you to follow the “Gita for Everyone” program in a very easy manner. You will find all the verses, summaries, division of sections, questionnaires, video tutorials and Power Points referring to the 18 chapters of the Bhagavad Gita As it Is based on Srila Prabhupada’s explanations. T​his is ​a​ booklet to help you following the “Gita for Everyone”​ course. 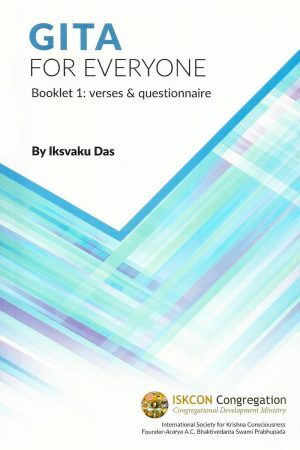 In this booklet you will find all the verses of the 18 chapters of the Bhagavad Gita As it Is along with the questionnaires for each chapter. The questionnaires are divided in subjects like Structure, Contents, Connection and Meaning. Th​is​ booklet will make ​your reading easier by enabling you to look up at any of the chapters, verses or sections of the book in no time. We hope this material will contribute in some way to make Srila Prabhupada’s desire a tangible reality.